Your invoice paid to MXF will get you everything from Phantomm and Open Builds which is everything pictured above. On the pictures I’ve often seen an aluminium extrusion right behind the makerslide (X-axis), is it required? 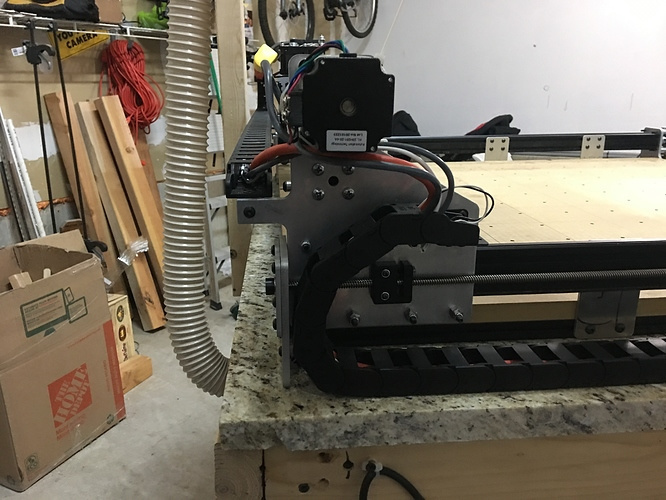 It looks like it’s something that comes by default with the new version of the X-Carve, is it worth upgrading my machine with this? Yes. It adds some rear support and holds the cable carrier. Thanks, what about the v-wheels parts? (See this comment) , do I have the right list of parts? I actually include the screws you will need, as 30mm is not really enough, 35 is what i include. But yes thats sound about right. Phantomm, I apologize. Patience is not one of my virtues. i work on it. I appreciate your effort to help out me and others. No need for an apology, I was the one who made assumptions. while we are looking at this, what are these two holes for? I’m very interested in doing this to my X carve. Can you guys point me in the right direction on where to start? I have a 1000mm setup X carve. PM the op and ask. Out of stock again, will update when flush again. Updated the website, should be back in stock by next week. saw a youtube vid? maybe check the forum. I just went to the auto repair store and bought a cheap 20 buck bearing puller. put the motor housing in a bench vice and used the puller. A pin punch and a clamp works too. or cut pulley in half.